Another update to this story. This is a text message that was never sent. The young man writing it didn’t see his friend soon. He never saw him again. 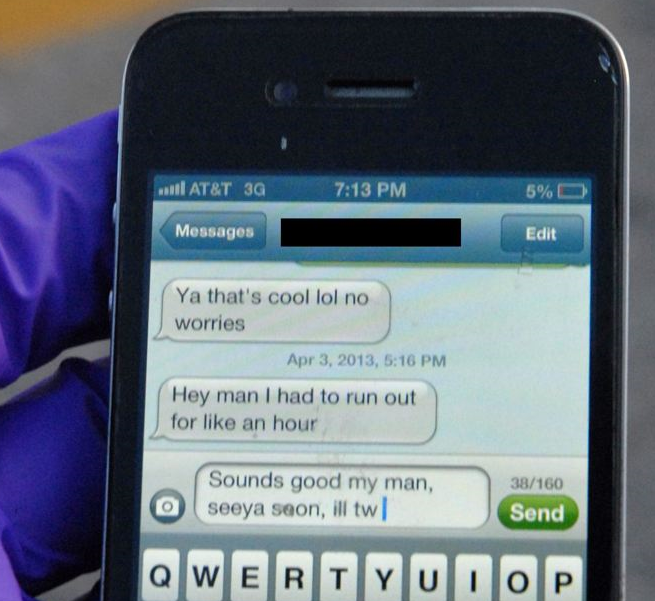 University of Northern Colorado student Alexander Heit was typing to an unidentified person when he lost control of his car and ran off the road. He was taken to North Colorado Medical Center where he later died. His parents are sharing this image in the hopes of convincing others not to text and drive. Our condolences go out to his family and friends, as well as our thanks to his parents for reaching beyond their grief and putting this photo in the public view. The next time you reach for your phone while driving, think about this young man, and if that’s not enough to get you to put it back down, think about his parents – is that text or email worth the risk of putting your family and friends in their shoes? Just a quick update to this story. As of 12:01 tomorrow morning (3/8/2012) a new state law will go into effect making it illegal to text message, instant message or email while driving in PA. http://www.post-gazette.com/pg/12067/1214921-147.stm. Automobiles are arguably the iconic products of the 20th century. At this moment, if I had to pick, I would say that smart phones and portable computers will be the iconic product of the 21st century – at least the early part. Perhaps over the next few decades we will devise solutions that will allow us to safety use them at the same time, but today they are in dangerous conflict. Last Tuesday, the National Transportation Safety Board finally called for a nationwide ban on the use of cell phones and text messaging devices while driving. I may be the only one, but I welcome it. For years we’ve heard about new laws against cell phone use while driving, but too many of those laws have been limited to hand-held phones despite studies that have shown the risk inherent with any type of distracted driving. The problem is that too often people think of distracted driving only in terms of visual and manual distractions; those that cause you to take your eyes off the road or your hands off the wheel, such as entering a phone number or reading a text. The dangers are obvious – even if we choose to ignore them. If you aren’t watching the road, you aren’t going to see the traffic light turn red. If your hands aren’t on the wheel, you can’t avoid the car that’s drifted into your lane. So we convince ourselves that if we can make or answer a call or text through voice commands, we are safe (see Salvucci & Macuga,2002, for evidence otherwise). And thus most of the laws to curtail distraction are directed against hand-held devices, leaving hands-free ones exempt. Americans, at least, routinely dismiss the dangers of cognitive distractions – those that cause you to take your mind off of what you are doing. After all we’re a nation of multi-taskers, with the innate ability to do more than one thing at a time, right? Wrong. The work of David Kieras and David Meyer, among others, has clearly shown that attempting to multi-task – either doing more than one cognitive task at a time or switching rapidly between tasks – causes the tasks to take longer and produces more errors than singly focusing on one task. So what does this mean for driving while talking on a cell phone – any cell phone? It means that when you focus on the conversation, you will have fewer mental reserves for driving. You may notice that the light has turned red, but not as quickly as you might have if you weren’t on your phone. You’ll see the car that’s drifted into your lane, but it may take your mind a fraction of a second longer to recognize the danger and respond to it. That fraction of a second may be all that you had. You may be able to sufficiently multi-task in other aspects of your life, like checking your email while listening to the TV or writing an article. But when’s the last time your computer or TV hurtled something weighing two tons at you at 50 miles an hour? A friend of mine often calls me while he’s driving – even though I hang up on him when he does – and he argues that talking on his cell phone can’t possibly be any worse than talking to a passenger in the car. He argues that both require the same mental energy and should have the same effect on driving; so if he is allowed to talk to his passenger, he should be allowed to talk on the phone. But he is ignoring a couple of key differences between those conversations. If you are talking to a passenger and traffic suddenly gets worse, most passengers will automatically slow or stop the conversation allowing the driver to focus. The person on the other end of the cell phone has no idea what sort of traffic conditions the driver is encountering and the pace of the conversation never changes based on them. And how many times has your passenger noticed that red light or drifting car before you did? The passenger is another set of eyes and ears than can help the driver avoid accidents. The dangers are particularly pronounced for younger drivers who have less experience behind the wheel. The routine task of driving, for those who have years of experience, does become automatic with experience (though again, I feel the need to stress that it is the unpredictability of driving that emphasizes the need for this ban). Younger drivers – those who are also more likely to answer that text – have not reached a level of experience for those routine aspects of driving to become automatic. These drivers require active attention at all times. Of course not everyone is in favor of the ban. Since it was announced I have seen some articles claiming that the risks of talking on a cell phone have been dramatically overestimated. These articles cite an upcoming study in the January issue of Epidemiology by Richard Young, PhD, which examined potential biases in a couple of influential studies. Those studies looked at the cell phone records of people involved in accidents and compared their cell phone use just prior to the accident to that from other time periods. I’ve not had the opportunity to read this article; however, even if the dangers have been overestimated based on these two studies, this does not negate the body of evidence that shows that hands-free cell phone conversations are no safer than those using a hand-held device in terms of cognitive distraction (Young & Regan, 2007). Many of the designers here believe that eventually innovations in cell phones and automobiles will resolve this issue, allowing us to drive and stay connected. Perhaps navigation assist systems will solve the problems – or phones that only allow conversation when there are lulls in traffic. But in the meantime, cell phones and automobiles are not playing well together. Young, K. & Regan, M. (2007). Driver distraction: A review of the literature. In: I.J. Faulks, M. Regan, M. Stevenson, J.Brown, A. Porter & J.D. Irwin (Eds.). Distracted driving. Sydney, NSW: Australasian College of Road Safety. Pages 379-405. Salvucci, D. & Macuga, K. (2002). Predicting the effects of cellular-phone dialing on driver performance. Cognitive Systems Research, 3, 95-102. So where do you draw the line? Should we not be passing laws against eating, reading the paper, painting your nails, drinking your coffee, listening to the radio, using a GPS device, and talking to passengers? We should be banning billboards, bumper stickers, and bus wraps, and outlawing driving with less than 8 hours of sleep. There are many potential distractions for drivers. I guarantee I am more distracted by a good audio book or podcast or singing along with a favorite song than I am telling my wife I’m on my way home from work. We cannot force the whole of society to be responsible through laws that are questionably enforceable. The number of deaths due to distracted driving are still small in comparison to those caused by drunk driving. I would argue that there is a disproportionate amount of attention being given to distracted driving. Fortunately this will only be an issue during the historically brief window during which technology is advanced enough to enable mobile communications, but not yet savvy enough to replace the driver altogether. It is paternalistic, but things would be safer if there were restriction for hand held operation. Even then, Parents need to be in touch with their children or family emergencies need to be communicated. So there should be some allowable transition time to convey the “Just a Minute” giving time to pull over for necessary calls (meaning your cell phone is on and in the car). And the NTSB recommends banning hands-free except for manufacturer’s installation. That is ridiculous. Generally the Mfg. installed device could be expected to be more expensive, where there is no obvious difference. Disingenuous!! I would welcome a ban on cell phones and text messaging devices! I commute to work on a bicycle quite often and have encountered many distracted motorists. Two ton objects and red lights are much easier to pick out than a cyclist.